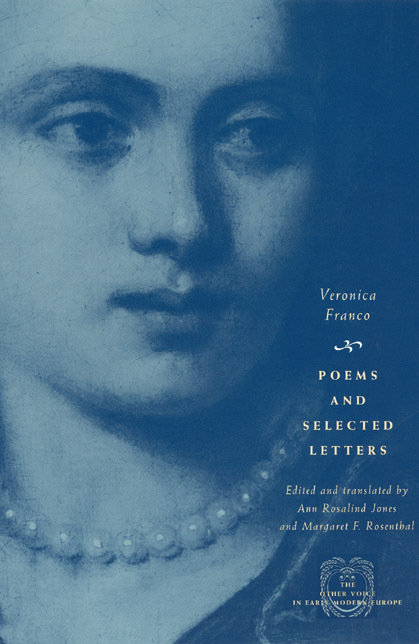 Veronica Franco (whose life is featured in the motion picture Dangerous Beauty) was a sixteenth-century Venetian beauty, poet, and protofeminist. This collection captures the frank eroticism and impressive eloquence that set her apart from the chaste, silent woman prescribed by Renaissance gender ideology. As an "honored courtesan", Franco made her living by arranging to have sexual relations, for a high fee, with the elite of Venice and the many travelers—merchants, ambassadors, even kings—who passed through the city. Courtesans needed to be beautiful, sophisticated in their dress and manners, and elegant, cultivated conversationalists. Exempt from many of the social and educational restrictions placed on women of the Venetian patrician class, Franco used her position to recast "virtue" as "intellectual integrity," offering wit and refinement in return for patronage and a place in public life. Franco became a writer by allying herself with distinguished men at the center of her city’s culture, particularly in the informal meetings of a literary salon at the home of Domenico Venier, the oldest member of a noble family and a former Venetian senator. Through Venier’s protection and her own determination, Franco published work in which she defended her fellow courtesans, speaking out against their mistreatment by men and criticizing the subordination of women in general. Venier also provided literary counsel when she responded to insulting attacks written by the male Venetian poet Maffio Venier. Franco’s insight into the power conflicts between men and women and her awareness of the threat she posed to her male contemporaries make her life and work pertinent today.